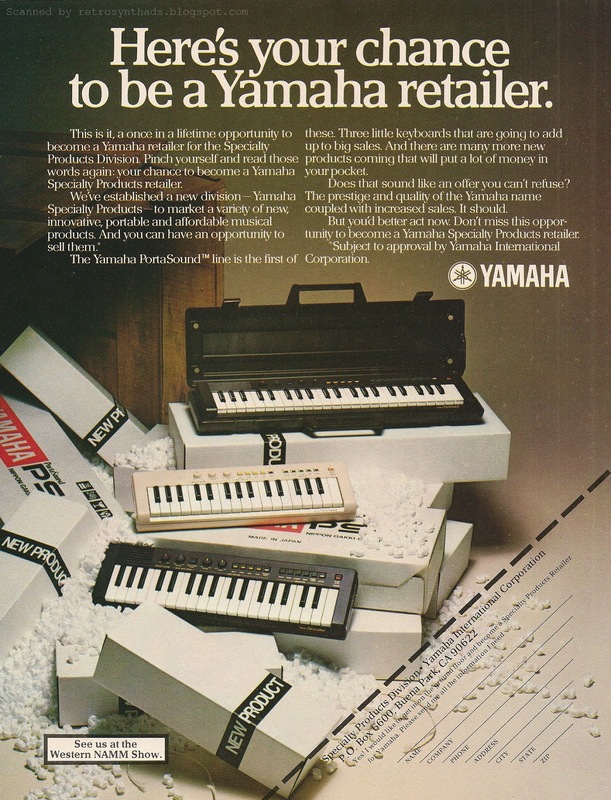 Yamaha Portasound Retailers "Here's your chance..." full page colour advertisement from page 41 in the February 1982 issue of Keyboard Magazine. Yamaha were always a little unusual in those early days. Almost as unusual as the Keyboard Magazine that this advertisement first appeared in. I've blogged about it before, but will always take the opportunity to point it out again whenever I get the chance. 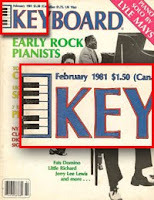 The February 1982 issue of Keyboard was incorrectly dated February 1981 on the cover. It's a rare thing when a magazine makes this mistake, and I think it makes this issue of Keyboard just that much more interesting and rare. Where was I ... oh yeah - Yamaha. Unusual. Like when the company suddenly cut into their famous DX-line of advertising with this warning for DX-7 and DX-9 purchasers on the dangers of buying grey-market synths from Japan rather than from authorized US retailers. And here we have Yamaha doing it just a little bit differently again. Back in the 70s and 80s, it wasn't unusual for smaller companies to use their generally small advertising space to also try and scope out new distributors. Smaller companies generally didn't already have distribution networks already in place. And so when Yamaha spends some good full-page colour advertising dollars to find Portasound retailers, I tend to get curious. This wasn't just a one-time shot like that grey-market advertisement - this ad appeared in the February, March, April, July and October issues of Keyboard in 1982. The advertisement actually contains some good historical information on the company. 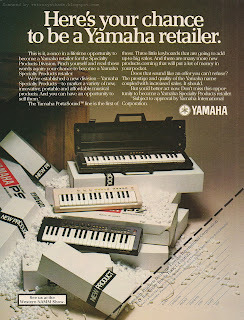 The ad-copy clearly states that Yamaha had created a new "Specialty Products Division" for their new Protasound line of keyboards. At the time, this included the PS-1, PS-2 and PS-3 - all visible in the ad. It's a good historical marker that I'll file way for later. 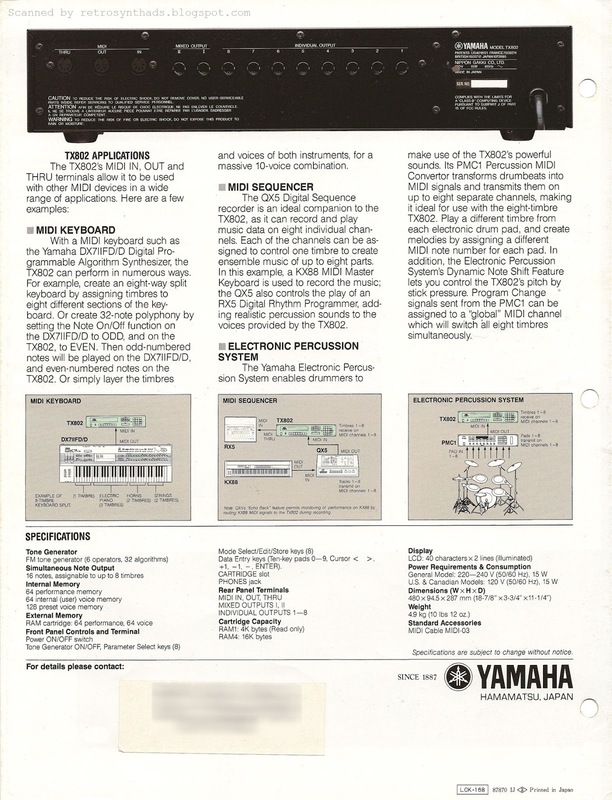 I blogged a little about Yamaha's confusing early 80s organizational structure a short while ago and the possible effects it had on the consumer. 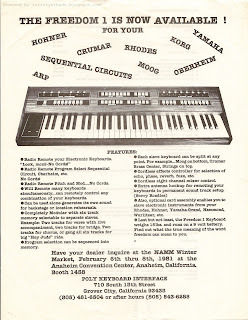 Or, I should say I pointed out what Dominic Milano had already said back in his March 1983 Keyboard Report on three Yamaha offerings - the PC-100, MP-1 and the lovely CS01. This rather new division - the Specialty Products Division- included portable battery-operated keyboards. Except the CS-01 battery-operated keyboard. That belonged to the Combo Division. Confusing? Yerp! It was quite normal for a company division to include a little tag line in an advertisement - a bit of an ego boost I suppose - but to actually have a particular division of a company calling themselves out publicly within the ad-copy itself is unusual indeed. And double-indeed that it can be unnecessary and confusing for the consumer. Especially in a consumer magazine such as Keyboard. The advertisement is also an interesting read because it's doing the hard sell to retailers. Like, really hard. "Pinch yourself and read those words again"
"Three little keyboards that are going to add up to big sales"
"Put a lot of money in your pocket"
"Yes! I'd like to get in on the ground floor..."
It's almost like I'm talking to my buddies who tried to get me in on pyramid schemes back in university. 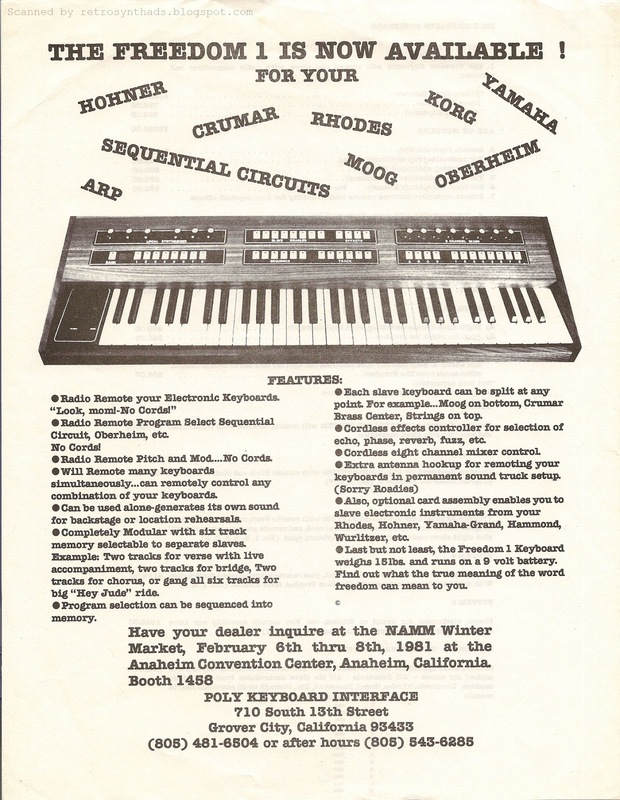 And if it wasn't for that lovely photo in the ad showing the current line of Portasound keyboards surrounded by styrofoam packing peanuts, you might be inclined to think it was a scheme to sell products that don't actually exist. But the Portasound line obviously did exist AND like the ad states, there were "many more new products to come". 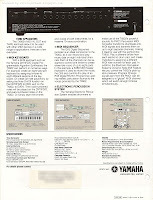 And that statement is backed up by the cover of the PS 1, 2 and 3 Playing Guide (Yamaha has a PDF on their Web site). Both the girl and guy on the cover are obviously really stoked, not only about their high-waisted pants, but also about their Portasound keyboards. 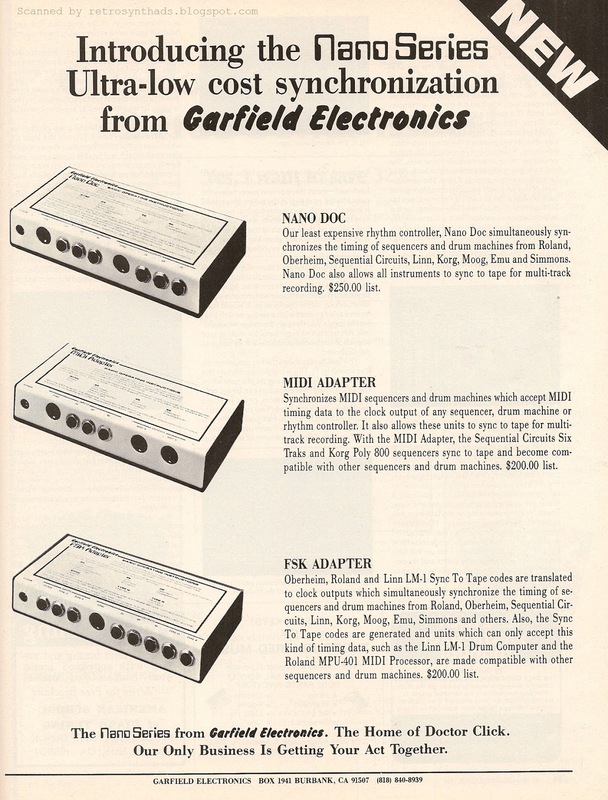 Garfield Electronics Nano Doc syncronizer, MIDI Adapter and FSK Adapter "Introducing the Nano Series Ultra-low cost synchronization" full page black & white advertisement from page 93 in the November 1984 issue of Keyboard Magazine. If you had asked me more than a month ago what products would come to mind if someone had mentioned Garfield Electronics, that would have included Dr. Click... and... well... that's it. I knew they made other sync products, but I couldn't have named them. Maybe the Dr. Click 2. Definitely not the Mini Doc. And as far as those other products that turned up in that last post - Dr. Flick, Modulator etc... yeah... not those ones either. And I was *really* into interfacing old and new gear. Funny how some gear just slips by without notice. I have to say that the Nano Doc falls into that group too. Maybe I just blur'd all those other products into the Dr. Click. I probably just thought they were all the same product. With respect to the ad itself, I have to say I'm a little disappointed that the Garfield ad-art has disappeared. Especially the artwork from that previous ad. Those drawings had legs (pun intended) and could have been easily expanded a long with Garfield's product line. Without the funny graphics, the ad kinda falls flat. That's too bad because Garfield was pumping out some cool, cheaper products that were starting to incorporate MIDI. And due to the nature of the product, it made sense for Garfield to name-drop like crazy - Sequential Circuits Six Traks, Korg Poly 800, Linn LM-1 and Roland MPU-401 MIDI processor. Nice. For whatever reason (I'm going to blame the lack of cool ad-art), the advertisement only showed up in Keyboard Magazine once or twice near the end of 1984. 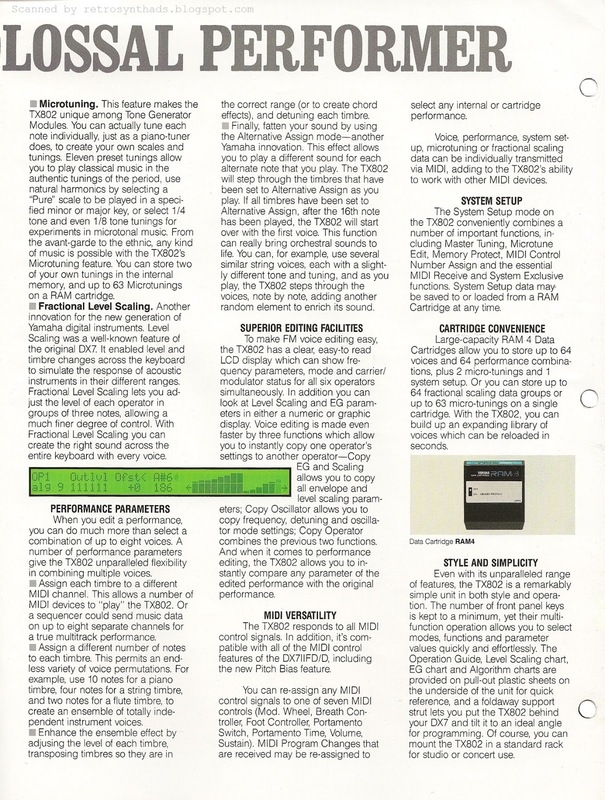 But the Nano Doc did benefit from a quick and dirty Spec Sheet promo in the February 1985 issue. "Garfield Rhythm Controller. The Nano Doc rhythm controller provides synchronization of sequencers and drum machines by Roland, Oberheim, Sequential, Linn, Korg, Moog, E-mu, Simmons, and othes. the unit can also be used to sync sequencers and drum machines to take for multi-track recording. Price is $250.00. Garfield Electronics, Box 1941, Burbank, CA 91507." Not really that specific. But luckily, almost 30 years later, someone was selling a Nano Doc on the InterWebz and took some great photos. And like other rack gear from Garfield Electronics, some good detailed instructions and functionality info can be found on the top of the device. Just keep clicking on that first image and eventually it will be displayed large enough to read the information on the top of the rack. 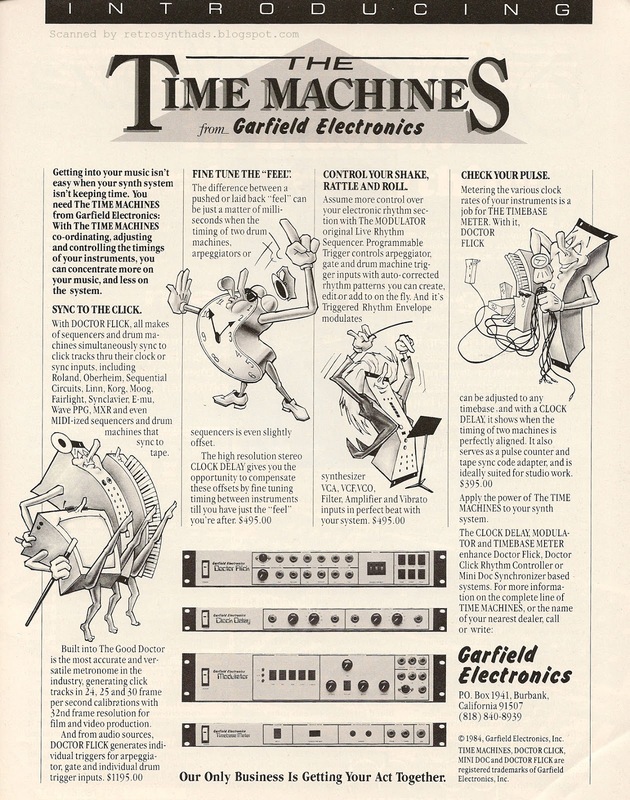 Garfield Electronics Doctor Flick, Clock Delay, Modulator and Timebase Meter "The Time Machines" full page black & white advertisement from page 21 in the July 1984 issue of Keyboard Magazine. Hot on the heels of the last Garfield advertisement for the Mini Doc is this awesome ad for four new products from the company. In the previous Garfield advertisement for the Mini Doc, the artwork was strictly decorative in nature. All readers got out of the artwork was basically a really nice illustration of a bunch of different gear looking angrily at each other. The artwork didn't even include the Mini Doc itself - a rarity in the synth-art work. Its great stuff, don't get me wrong, it just didn't provide any other purpose than to give a single salt-shake of context to the ad. But in this latest advertisement, the artwork not only includes imagery of each device, but the drawings also give readers the benefit of some clear indication as to the functionality of each device. And that's a good thing too, because although the ad-copy tries its best to describe each device and its very specific purpose, unfortunately with only one page of ad-space readers are bound to be left a little confused. But that artwork does a pretty good job of filling in the gaps. The imagery for the Doctor Flick shows the device dancing in unison with other gear. The device allows sequencers and drum machines all to simultaneously sync to click tracks. The Clock Delay imagery details the device as a traffic cop, a good illustration for a device that helps "fine tune" the feel of the sync time between two pieces of gear by nudging the timing forward or backwards to create a laid-back or pushed feel. The artist chose to illustrate the more complicated Modulator as an orchestra conductor. This more complicated device has a sync'd programmable trigger to control arpeggiators, gates and drum machine triggers as well as a triggered rhythm envelope to modulate synthesizer VCOs, VCFs and VCAs in sync with the timing of the music. And finally, the drawing of the Timebase Meter has the device holding the sync cords of a number of other pieces of gear while looking at his watch. This device allows Dr. Flick to adjust to any time rate, and when used with the Clock Delay it indicates when two pieces of gear are perfectly aligned. All four devices seem to be much more rare than the Doctor Click and Mini Doc devices - both in auctions and online in general. But I did manage to find a few good references. Although the Dr. Flick does seem to be a rare beast online, I did find one 2008 MATRIXSYNTH auction post for the device that provides a lot more detail. it even includes a photo of the top of the rack that includes some basic operating instructions and reference information on different devices clock rates. Nice. The Clock Delay also appeared in a 2012 MATRIXSYNTH auction post that provides photos of the top of the rack with some basic operating instructions. 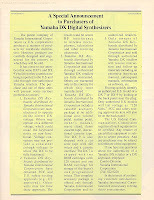 And if that's not enough for you, it also appeared in the Spec Sheet section of the December 1984 issue of Keyboard. Both provide intimate details that could never have made it in to the limited space available in the ad-copy. "Garfield Delay. The stereo Clock Delay provides a means to compensate for rhythmic offsets between various makes of sequencers, drum machines, arpeggiators, and synthesizers. the offsets are typically due to the differing response times of various instruments to incoming clock signals, and cause the "feel" between instruments playing together to be "out of the groove". Each channel provides 24 milliseconds of delay, selectable in 2-millisecond steps with a continuously variable fine-tune control for adjusting the feel. The channels provide click, clock and trigger output pulses with rising or falling edge polarity to meet the clocking requirements of all instruments. The rising and falling edges are cascadable for delays of up to 48 milliseconds. The unit is designed to allow you to adjust the rhythmic feel so that it can be pushed, laid-back, or on top of the beat, as desired. 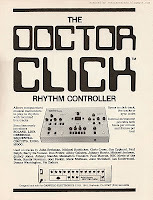 The clock Delay works as an accessory to synchronization systems base around Doctor Click, Mini Doc or Doctor Flick rhythm controllers. Price is $495.00. 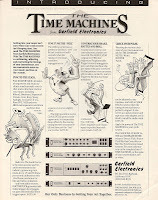 Garfield Electronics, Box 1941, Burbank, CA 91507." "Garfield Rhythm Sequencer. The Modulator is a live-performance-oriented rhythm sequencer that features a programmable trigger, which can be used to control arpeggiators, gate external devices, and trigger external drum machines; and a rhythm envelope, which can be used to control VCAs, VCFs, and VCOs on external synthesizers in rhythms locked to the beat of the system. The trigger can be programmed in 3/4, 12/8 or 4/4 time, in one- or two-measure patterns. It can be synced to the clock or sync output of the sequencers and drum macines. The envelope features variable attach, decay, pulse-width and level controls, and can be triggered either from the programmable trigger or from an external source. When multiple synthesizer overdubs are made with the rhythm envelope, all modulation waveforms rhythmically mesh with each other and the tempo of the music. Price is $495.00. 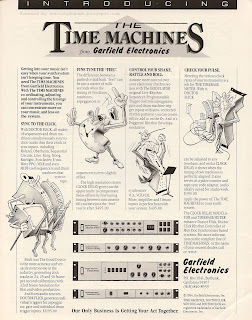 Garfield Electronics, Box 1941, Burbank, CA 91507." Unfortunately a quick Google search for information on the Timebase Meter didn't bring up much. I'll dig a bit further and see if anything hits my radar. I'd really like to know more about that one. Before I end the post, I'd just like to point out one of the other reasons I love this advertisement - retail prices! Not all companies do it, especially as the prices start going above the two grand mark. But Garfield provides prices for all four: Dr. Flick - $1195.00; Click Delay: $495.00; Modulator: $495.00; Timebase Meter: $395.00. Garfield Electronics Mini Doc "When Your Automatic Drummer .... Isn't / And Your Sequencer ...Won't." full page black & white advertisement from page 41 in the February 1984 issue of Keyboard Magazine. I last blogged about Garfield Electronics back in 2010 when I featured their Dr. Click introductory advertisement as well as their more descriptive follow-up ad. Together, those two ads ran from December 1982 to January 1984 before this advertisement took over. And this advertisement would continue to show up monthly through to June 1984. Five months - not a bad run. So, why the renewed interest? 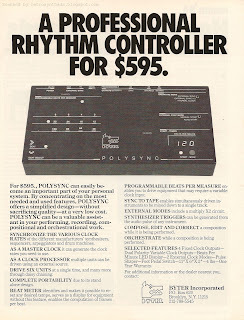 Well, about a week or so ago, I blogged about one of Garfield's rather unknown competitors - the Polysync Rhythm Controller by Byter Incorporated. And in that same issue was this advertisement for the Garfield Mini Doc. Next thing I know I'm digging through old Doctor Click posts to play catch-up. I don't want to spend too much time on the specifics/differences of the Doctor Click with the Mini Doc - I just don't have the time to do the comparison. And Jon Sonnenberg through his Art of Travelogue blog has already taken care of that dirty business in a small but well-writing post from back in July 2012. Click on the "About" tab on his blog and you will learn his band has opened for The Human League, Pink Dots, Anything Box, Solvent and others. Nice resume! Go Jon! Why didn't I have the time to compare the two? BECAUSE I'M TOO HYPNOTIZED BY THAT AWESOME ARTWORK. You might not be aware, but I'm a sucker for great artwork in a synth advertisement. Just click on the label "artwork" at the end of this blog post to see some other great artwork featured in ads on the blog. Some of the more recent Retro Synth Ads blog posts that have included ads with great artwork include those from Boss and the Yamaha Producer Series. 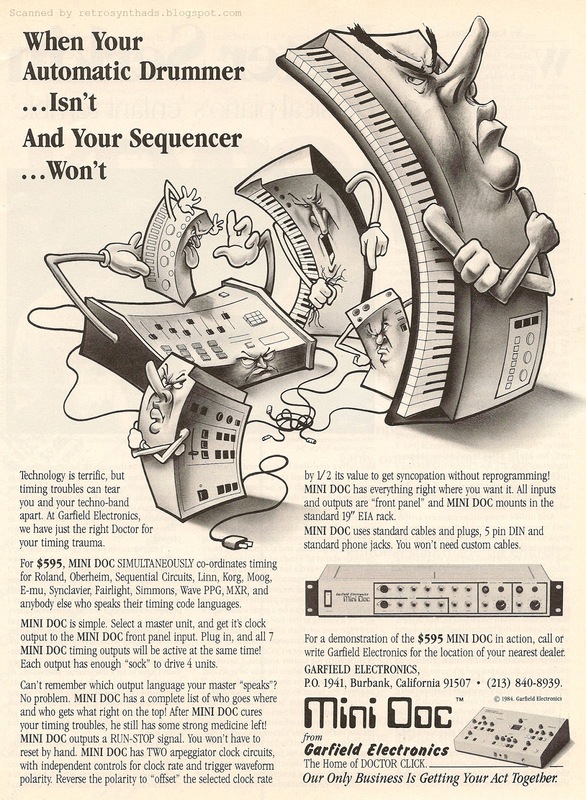 Go further back and you will find great artwork companies big and small, such as ads for Sequential Circuits, Dennis Electronics, Oberheim, Korg, and Octave. All brilliant in their own way. And they all should have somehow found their way onto t-shirts. This is the first time we see artwork from Garfield and I'm excited by it. What is interesting and different about the artwork for this Garfield Mini Doc ad is that it DOESN'T actually include the Mini Doc itself. In most if not all of those other company's advertisements, the gear for the most part plays centre stage in the artwork - on its own, being played by musicians or personified in some way. But not here. Garfield does include a photo of the Mini Doc, as well as it's flagship Doctor Click, but its rare indeed for a company to spend money on artwork that doesn't include their own gear. And I love how all the gear in this advertisement are angry at each other - it's only a matter of time before a battle royal breaks out. I'm pretty sure the artist even seems to have used real instruments as models - I think I can make out a Roland TR606, Oberheim DX and a Drumulator (?) drum machine. I am a little disappointed that none of the keyboards look more like old synths with lots of knobs. Unfortunately, as is often the case with advertising artwork, there is no artist's signature hidden away within the drawing. 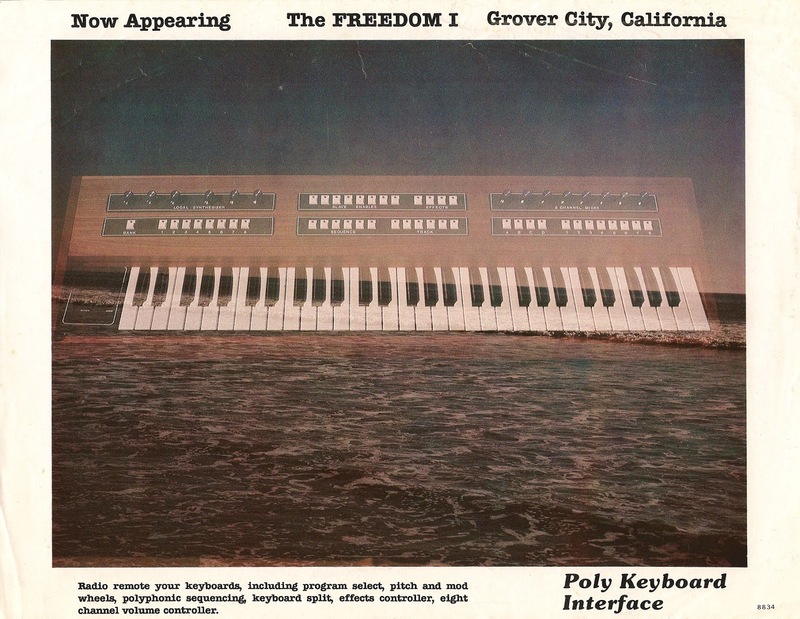 Poly Keyboard Interface Freedom 1 reference/sell sheet and colour photo promotion sheet from 1981. Here we have the follow-up to last Monday's PKI Freedom 1 advertisement that appeared in Contemporary Keyboard in February 1981. I'd add an image of that ad to the right of this text, but it is *exactly* like the front of this reference sheet - so no need. Plus I'm feeling lazy after a long day at work. You can read that last blog post for my initial thoughts on the Freedom 1. Today I'd like to focus on the back on this sell sheet with all that juicy historical reference information. First - awesome to learn that PKI had separate "systems" for sale. 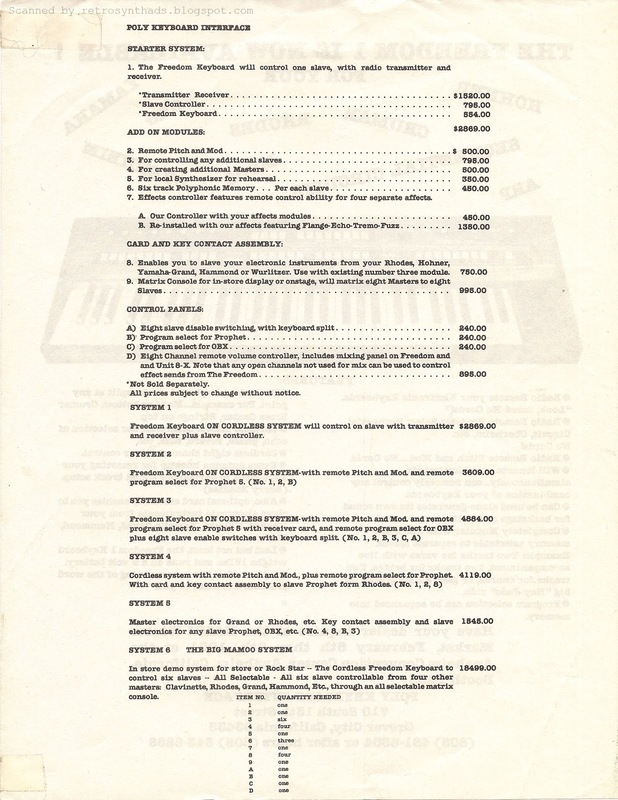 The Starter System, aka System 1 included the Freedom keyboard, a transmitter/receiver and one slave controller for the low low price of $2,869.00. From there, the systems went up in price depending on the configuration. 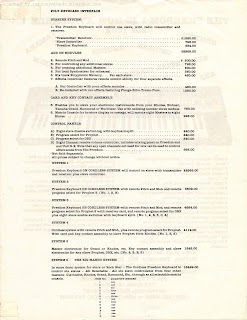 For example, if you wanted the system to play a Sequential Circuits Prophet 5 remotely, with the additional remote control of it's program select, pitch and modulation, it would set you back $3,609.00. 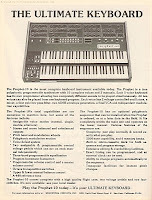 Want to control the SCI Prophet 5 and an OB-X with keyboard split - $4,884.00. If you read my Freedom 1 advertising blog post, you know I was a little confused about the Freedom 1's sequencing capabilities. I was hoping this reference sheet would clear some of that confusion up... but no dice. We do learn that the "Six track Polyphonic Memory... per each slave" is $350 bucks. But that's about it. Boo. Well, before I sign off, I just have to comment on the elephant in the room. I'm talking about that colour photo I've also posted that seems to have been passed around as part of the Freedom 1 promotion. Or, should I say, that photo of a beach, with a faded Freedom 1 keyboard superimposed on top of it. Poly Keyboard Interface Freedom 1 pre-MIDI remote keyboard controller introductory full page black & white advertisement from the February 1981 issue of Contemporary Keyboard Magazine. Here's a rare quirky beast. 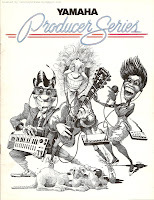 Quirky enough that it made it into the "Mutants and Missing Links" section of Mark Vail's Vintage Synthesizers book alongside such notables as the Paia Oz, PMS Syntar and Gleeman Pentaphonic. 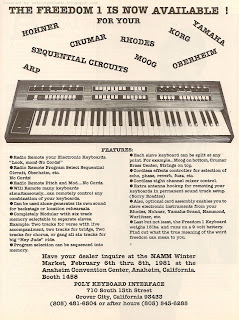 At first glance, this advertisement could almost be mistaken for an early Sequential Circuits Inc. Prophet 10 advertisement (see right) - also running in CK around this time period. And although it definitely ISN'T a Prophet-10, it could probably control one. 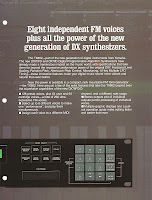 See, the Freedom 1 was a pre-MIDI remote keyboard controller, allowing a musician to remote control a number of synthesizers through one keyboard. With MIDI coming up in less than two years, this thing unknowingly had a limited life span. The advertisement only seems to have appeared once in CK (?) 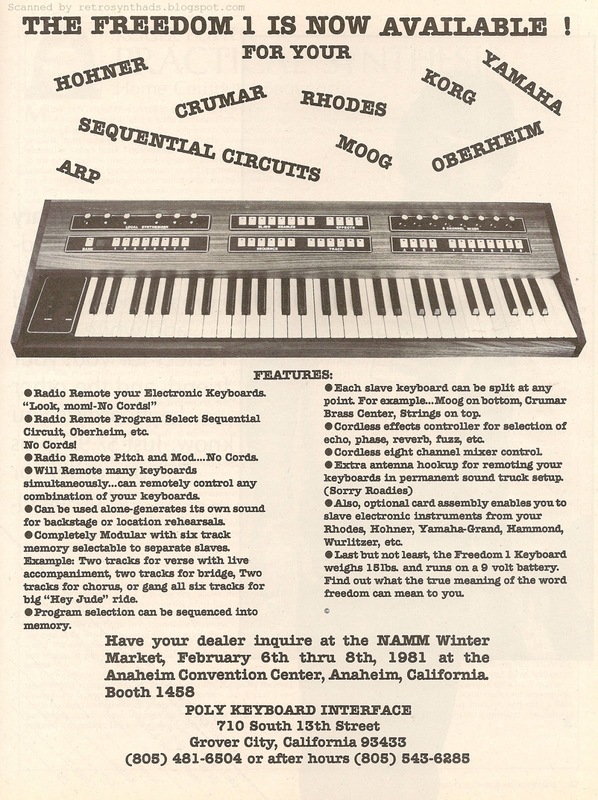 as a heads-up to interested readers that they could find out more information about the Freedom 1 at the 1981Winter NAMM running in February at the Anaheim Convention Center. I realize this was pre-Internet, but I almost feel that PKI tried to cram too much information into the advertisement. or maybe its just too wordy. Or maybe it just looks disorganized because of the company names scattered randomly across the top so close to the ad-title. Bah. It's still too early on a Sunday morning to think about. If it's also too early to read through the ad-copy in your part of the world, luckily a small Spec Sheet accompanied the ad in the same issue, summing up the advertisement quite nicely. "Poly Keyboard Interface. The Freedom 1 is a remote controller that will drive a number of keyboard instruments simultaneously. It is also light enough to wear around your neck. The unit is radio-controlled, so no patch cords are needed to interface it with other keyboards. Electronic and electromechanical keyboards can both be interfaced. It has a 5-octave keyboard, a 6-channel sequencer, an 8-channel mixer, and pitch and mod wheels. It weights 15 lbs (6.8 kg). 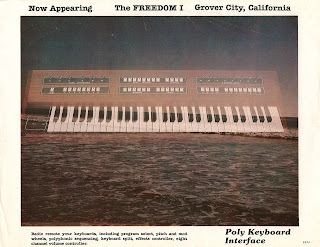 Poly Keyboard Interface, 710 S. 13th St. Grover City, CA 93433." 6-channel sequencer? 8-channel mixer? Okay, maybe it is time to get some coffee in me so I can take another look at that ad copy. Eventually caffeine successfully hit my cerebral cortex and brain stem and I could concentrate enough to read through the ad. And I'm quite surprised. Not at what was included in the ad copy, but what wasn't. According to the Spec Sheet, this beast had a six-channel sequencer, but its not directly mentioned in the advertisement at all. There is mention of "tracks", and the ability to have a program selection "sequenced into memory". But no mention of things like the number of notes available in memory - the number one question of any sequencer. Another cool thing about the Freedom 1, but yet not directly mentioned in the ad is that it's light enough to wear around your neck. KEYTAR!!!! The ad does mention that weights only 15 pounds and runs on a 9 volt. But why not actually say it. 25 words of ad-copy and they don't actually say its wearable. Lost opportunity. The ad does get into some specifics. For example, I'm really digging the Freedom 1's wireless abilities. Cordless is where I want my keyboards to be at some point in the future. I purchased a used M-Audio's MidAir25 wireless MIDI controller and although I haven't hooked it up yet, I think it will be cool to be able to move a small battery-operated two-octave keyboard around the studio without having to worry about cables getting in the way of everything. I really dig a company that will add a little bit of humour into their ads, and PKI does just that. Things like "Look, mom!-No Cords" or apologizing to roadies since it comes with an antennae hookup for remoting the keyboards from the sound truck. Speaking of which - I'm a little confused. If a band is going to lug around quite a few cool looking analog synthesizers around the country, why wouldn't you want them on stage with you? Isn't that what being a keyboardist in the 70s and 80s was all about? Unfortunately, whenever I picture a musician surrounded by keyboards, I think of Rick Moranis in that one SCTV skit about Tex and Edna Boil Organ Emporium, where Tex leaves Edna Boil and she has try-outs to replace him. 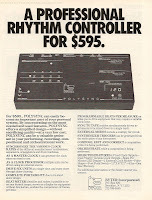 Byter Incorporated Polysync Rhythm Controller "...for $595" full page black & white advertisement from page 31 in the April 1984 issue of Keyboard Magazine. 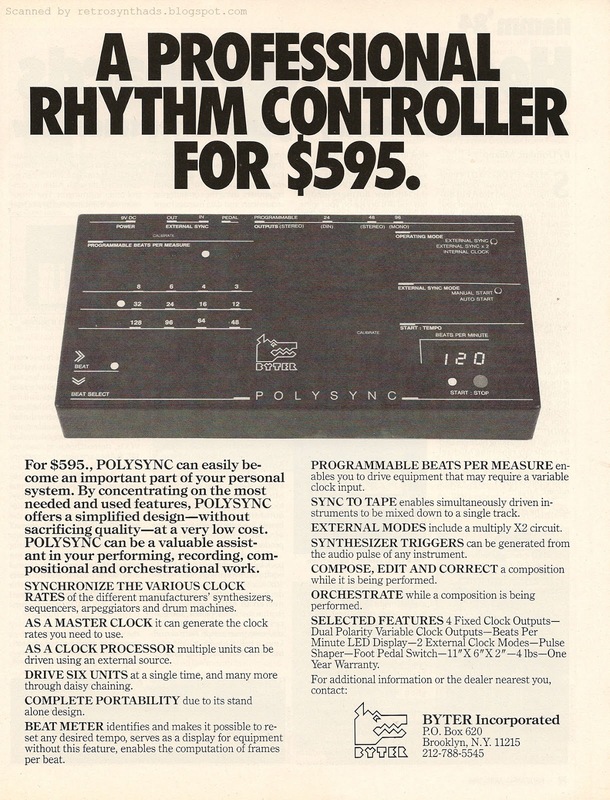 While looking through the April 1984 issue to get some information on Dave Formula (a la Magazine and Visage) I came across this advertisement for Byter Inc.'s Polysync. Don't remember it from back in 1984? Neither do I. But its 2013 and now my heartstring's always getting pulled when there is a nifty logo about. And Byter Inc.'s simple but playful dog head logo was EXACTLY the type of logo I can fall in love with. Maybe even tatoo-worthy. This logo makes me clap my hands together and jump up and down. No kidding. Yeah, I love this logo. And I love sync boxes like the Polysync. They also make me clap my hands and jump up and down. Again - not kidding. There is just something about the feeling I get when sync'ing old drum machines, arpeggiators and sequencers together. But like I said, I don't remember this box. I remember other sync boxes of the time period, like the Garfield Electronics Mini Doc that was also featured in this issue of Keyboard ten pages previously. For the exact same price: $595. I was a little surprised that the Byter Polysync didn't include MIDI. This was 1984 after all. 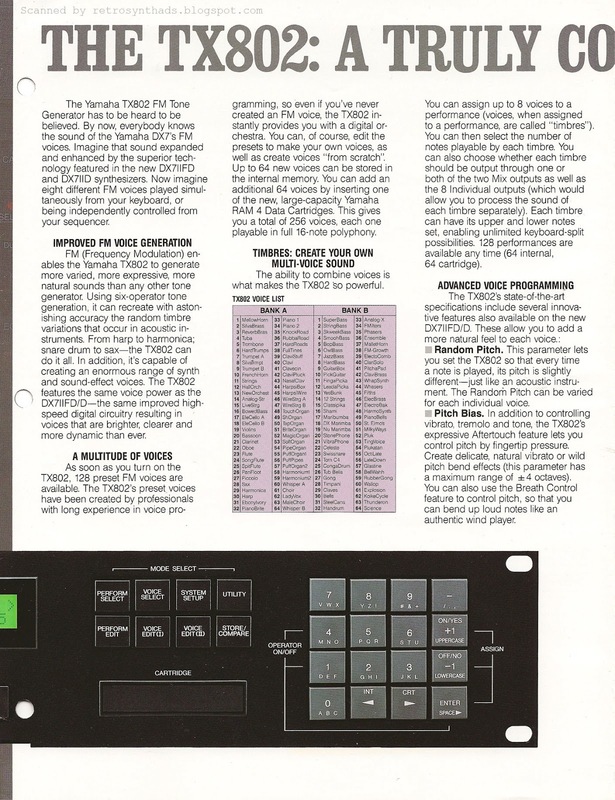 The SCI Prophet-600 had been out for quite a while and, in fact, this issue of Keyboard featured a SCI Six-Trak/Drumtraks advertisement. MIDI was all the rage. Or was it? Flipping back to the Mini Doc ad, I realized it too didn't include MIDI. And flipping throughout the magazine I found ads for the Roland SH-101< Oberheim OB-8/DMX/DSX/DX, and the Linn Electronics LinnDrum - all sans MIDI. 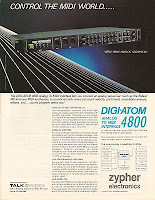 Even better, and MIDI-related, is the ad for the Digi-Atom 4800 analog to MIDI interface. Yup - you heard right. NOT MIDI to analog, but the other way around. Allowed your analog gear to control your less-superior MIDI gear. Awesome. Well, since I didn't know anything about this beast, I decided to Google "Byter Polysync". And guess what? Nothing. Well, in English anyways. There were two hits in other languages, and when I clicked on the first one, I got a giant "VIRUS WARNING" message from my anti-virus program. So, that ended that. 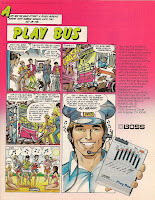 Googling just Byter Incorporated also brought up nothing. So, it makes me wonder if this piece of gear was just vaporware. Well, obviously a box or two made its way into production for the photo, but did it ever get mass produced? The advertisement lasted a surprisingly long six months in Keyboard Magazine - April to September 1984. So, there must have been getting some funding from somewhere. Very curious. If anyone has one or has seen one in the wild, please leave a comment. Really interested to know more. In the mean time, I'll get started on the tatoo design for the logo. 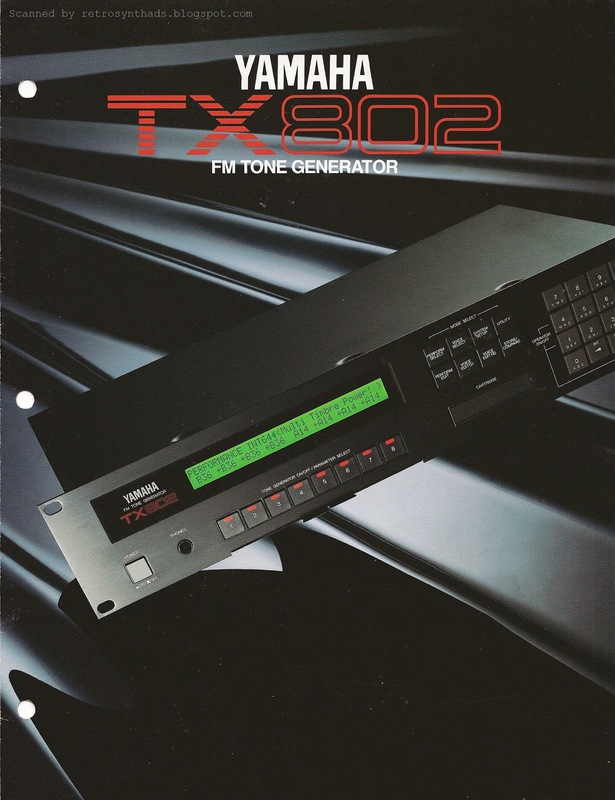 Yamaha TX802 FM Ton Generator "A Truly Colossal Performer" six page gatefold colour brochure from approximately 1987. Summer is slowly making its way here - and I'm loving it. The problem is that when its starts getting nice out, it also starts getting harder and harder to concentrate on writing blog posts. So, it's a sure sign that when I start scanning larger documents it's so I can feel less guilty writing less about them. 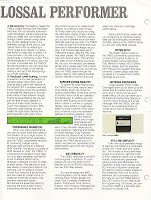 So, here's a request from reader of the blog "GinTonic" - a scan of a six-pager for the TX802. He loves his TX802 and has had it for years. At the top of this post, I included higher-res scans of each individual page in the order that one would probably read the information. I have also included lower resolution scans below as you would find the pages if you unfolded the brochure. Part of fun of designing brochures is the "art" of the fold. There are a number of different folds available and a designer will often choose to use a certain fold type to enhance the design. In the case of this brochure, the six page gatefold was used (third one on the top row below). The gatefold provides some great opportunities for interesting design. For example, when the reader flips open the front cover of this brochure (scan 1) the first two pages seen before folding out the other side of the gatefold are scans 2 and 3 (see below). What the reader first sees is a nice little introduction to the TX802 including feature highlights and a really large front panel photo. 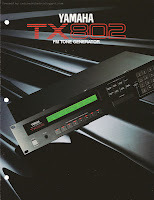 And even though two pages are not really "connected" to each other, it was designed as one large page, with thw photo of the TX802 spanning the full two pages. 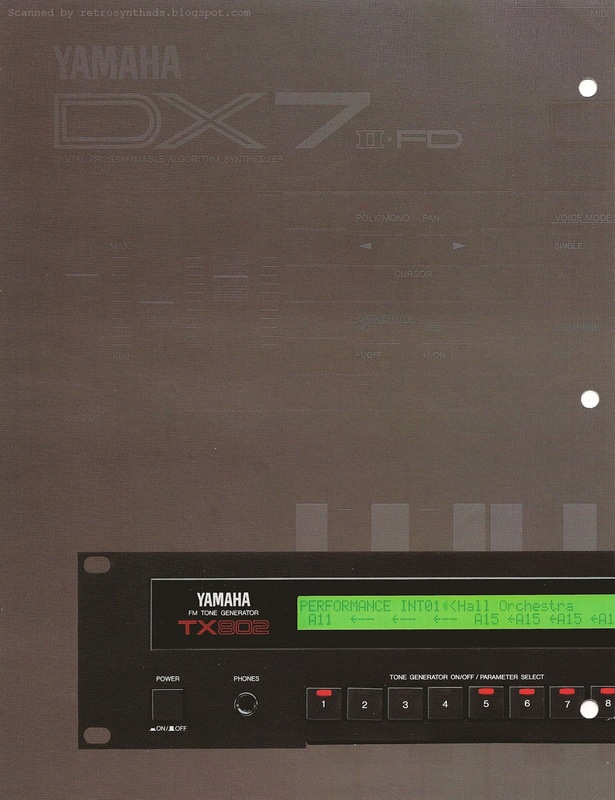 And did you notice that the faded background image - a DX7IIFD - also spans the two pages? Nice touch. Then, when the reader unfolds the other side of the "gate" to the right (scan 3), it reveals the three-page "inner spread" (scans 2, 4 and 5). 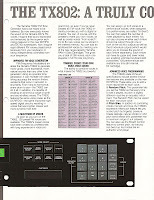 The designer set up the page so that the reader still gets that view the photo of the TX802 spanning across two pages. And now, the "flow" of the design continues with the title (A Truly Colossal Performer) and brochure text spanning across the rest of the inner spread - scans 4 and 5. Hope my description makes sense and does the whole thing justice. Good design in a brochure is one thing. But good design of an actual rack synth is another. Programming an FM synth is hard enough as it is, but it gets even more confusing when you try and cram all those buttons into 19 inches of front panel space. But Yamaha does everything possible to try and make it easy on the user. For example, using different colour buttons to distinguish the Mode Select buttons and the keypad buttons is helpful. Better yet, one of the really fun features of this generation of Yamaha racks is their little slide-out reference sheets that attach underneath. I've come across some racks that include reference information on the tops of the racks, but that becomes useless once you've actually racked the thing. I first came across this feature with the TX81Z and found it really handy to have all the program editing info and the diagrams of the eight oscillator algorithms readily available. And, even better - with the TX802, you get TWO pull-out sheets. One contains all the page editing info, and the other one is dedicated to all 32 wonderful algorithms available on the TX802. 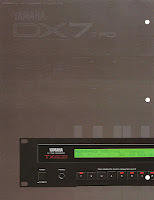 I believe the other Yamaha rack unit - the TX812/816 - also included a pull-out sheet (or two?). Or at least it looks like it in photos I've seen online. But I've never had the opportunity to get my grubby little hands on one. YET. 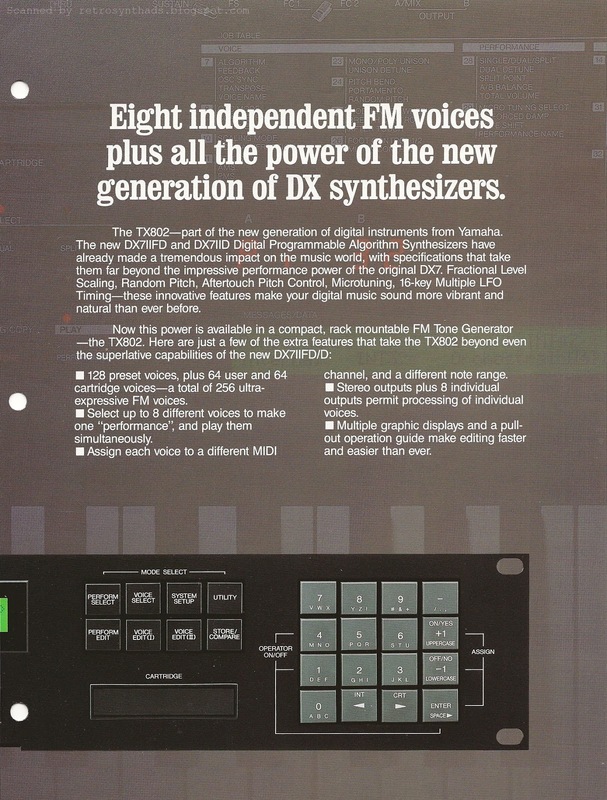 Sadly, that big two-page front panel photo of the TX802 in this brochure doesn't include the pull-outs. They've been removed, leaving a gaping hole at the bottom of the unit (directly underneath the LCD readout). That's the only flaw I can find in this thing. Now go read it.